When 58-year old Shahid Khaqan Abbasi was picked for the prestigious office of the Prime Minister of Pakistan a month ago, it was supposed to be a stop-gap arrangement for about 45 days. The arrangement was to last until the deposed PM Nawaz Sharif’s younger brother Shahbaz Sharif was elected as a Member of the National Assembly from the Lahore constituency that fell vacant. The plan was to keep Shahbaz Sharif in the seat till the scheduled general election in June 2018, and until his brother was able to legally clear his name and become eligible to contest again. However, the plan was changed and Nawaz Sharif’s ailing wife Kulsoom was fielded as the ruling Pakistan Muslim League-Nawaz (PML-N) candidate in the Lahore byelection. One of the reasons stated for not fielding Shahbaz Sharif was the need to keep him in Punjab, the most populous province which can vote a political party into power given it has 183 out of 342 seats in the National Assembly. As the long-serving chief minister of Punjab, the younger Sharif has built alliances and nurtured voters in the province due to his reputation as a capable administrator and hard taskmaster. So now, Abbasi will serve as the PM for about 10 months. He could even stay longer in office if the PML-N wins the coming election and if Shahbaz Sharif is disqualified as a result of the legal challenge some of the opposition parties are likely to mount against him. 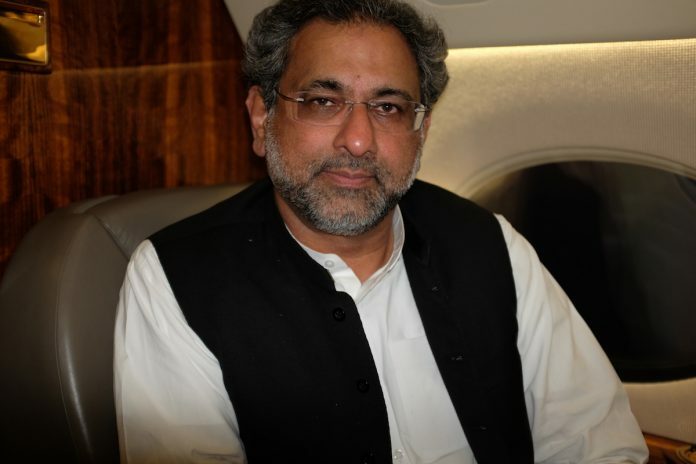 Abbasi’s military links should serve him in good stead while interacting with Pakistan’s powerful army — his late father Muhammad Khaqan Abbasi was an air commodore in the Pakistan Air Force and later became a federal minister in military ruler General Ziaul Haq’s cabinet. His father-in-law was a general in the army. Despite the temporary nature of his job, Abbasi appears determined to make a mark. In his maiden speech on 1 August, he remarked that he may be the PM for 45 days or 45 hours, but he wasn’t there just to keep the seat warm and intended to get some important things done. He has brought structural changes in the cabinet by merging some ministries and departments and scrapping a few in a bid to improve the government’s functioning. The power and petroleum ministries were merged to create the ministry of energy to be run by him. The Economic Coordination Committee was taken away from the finance minister and placed under the prime minister. Abbasi also decided to keep the planning and development portfolio, concentrating power in his hands after having appointed a large number of ministers to an unwieldy cabinet. The cabinet’s size was clearly aimed at bolstering support for PML-N ahead of the 2018 general election. It has already reached the limit of 47 ministers. In addition, eight advisors and five special assistants to the PM were appointed to make it one of the largest cabinets ever. Abbasi justified the cabinet’s size by arguing that he had limited experience in running the government and needed more ministers, advisers and special assistants. His answer was unconvincing given he had served as federal minister twice, was chairman of the Pakistan International Airlines, launched and successfully managed a private airline, and won seats in the National Assembly six times from his native Murree-Kahuta constituency in Punjab. Abbasi also worked as an electrical engineer in the US and Saudi Arabia after completing his education from the George Washington University. It is noteworthy that Abbasi did something that Nawaz Sharif never considered even after serving as PM for more than four years. He appointed a full-time foreign minister, Khwaja Mohammad Asif, for the first time since the PML-N victory in the May 2013 general election. Nawaz Sharif was handling the portfolio without contributing much due to his busy schedule. The opposition had repeatedly criticized the government for failing to appoint a foreign minister at a time when Pakistan was confronted with the prospect of diplomatic isolation. Also, for the first time in more than 20 years, a Hindu parliamentarian Darshan Punshi was inducted into the federal cabinet. The decision was an apparent bid to reassure minorities scared by rising intolerance in Pakistan and militants attacking their places of worship. As he began settling in the job, Abbasi started earning the grudging praise of his detractors. Until now, he was seen as a placeholder for the Sharif family, chosen by the dynasty due to his unflinching loyalty. But Abbasi initiated certain measures that show he has a mind of his own. He held meetings for devising a policy to ban and curb the use of prohibited bore arms and announced the much-needed infrastructural development package of $240 million and $47 million for Karachi and Hyderabad, respectively. The development package was apparently in return for the support he received from the MQM-Pakistan, the party representing the Urdu-speaking Mohajirs. He also set up a bi-partisan parliamentary committee to investigate Ayesha Gulalai’s sexual harassment allegations against opposition leader Imran Khan. Unlike Nawaz Sharif, he has been attending parliament sessions. Abbasi has also visited traditional ally, Saudi Arabia, and confidently led the National Security Council comprising the top civil and military leaders to reject President Donald Trump’s allegations that Pakistan was providing safe havens to terrorists. Rahimullah Yusufzai is Resident Editor with The News International, Peshawar and Correspondent with BBC World Service. Next articleTalk Point: What measures are needed to ensure that every Indian school has trained teachers by 2019?